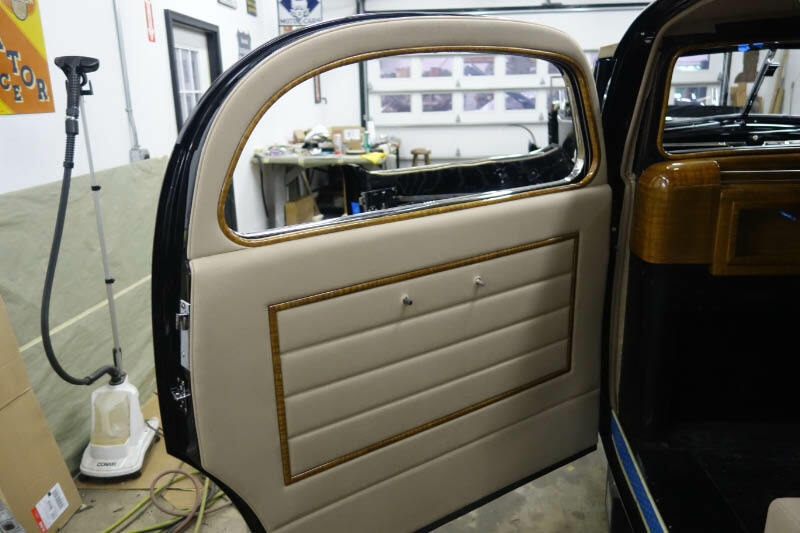 For the last 16 months, automotive historian Walt Gosden has been documenting the restoration of the 1937 Chrysler Imperial C-15 Town Car built for Walter P. Chrysler and his wife Della. 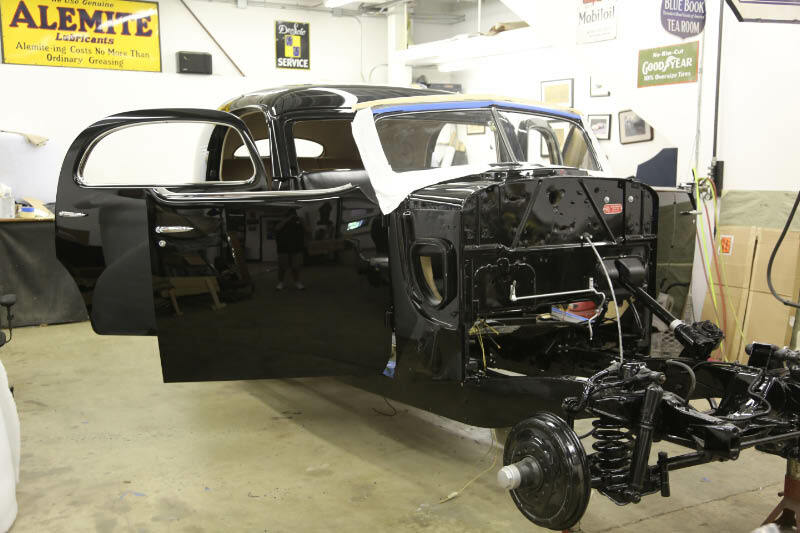 In the eleventh installment of the series, Walt describes the current state of the restoration with two months until the restored automobile's debut at the Pebble Beach Concours d'Elegance. 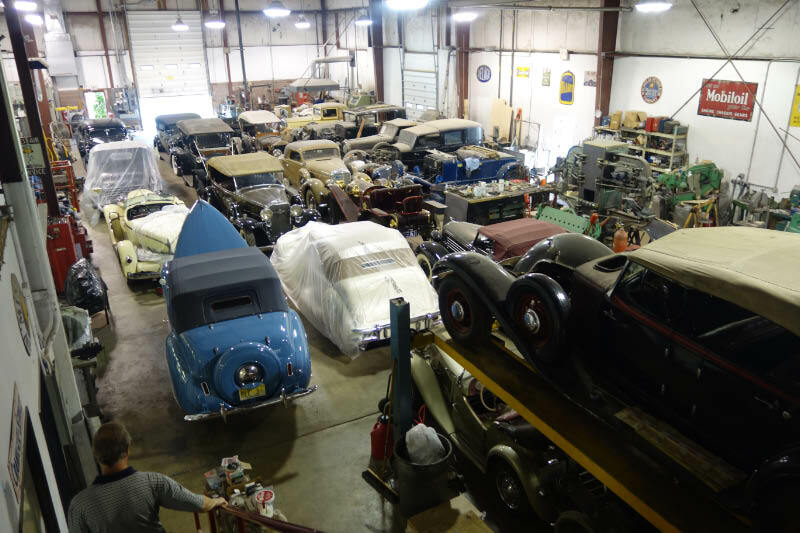 We visited Automotive Restorations on June 14th, Flag Day, so the flags were out for our country and it was a banner day for us as well to see the progress that had been made in exactly one month. 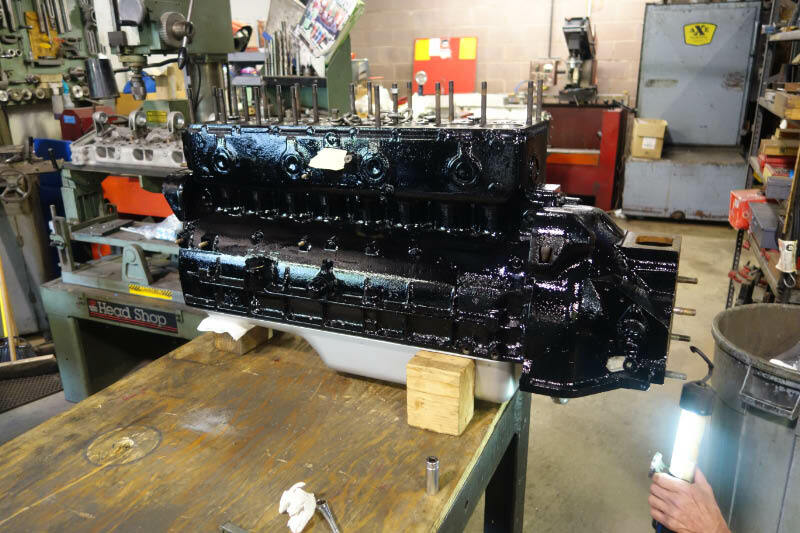 The main engine components (pistons, rods, crankshaft, and cam ) have been assembled back into the block and the oil pan has been refitted as well. The exterior of the block has been painted as well. 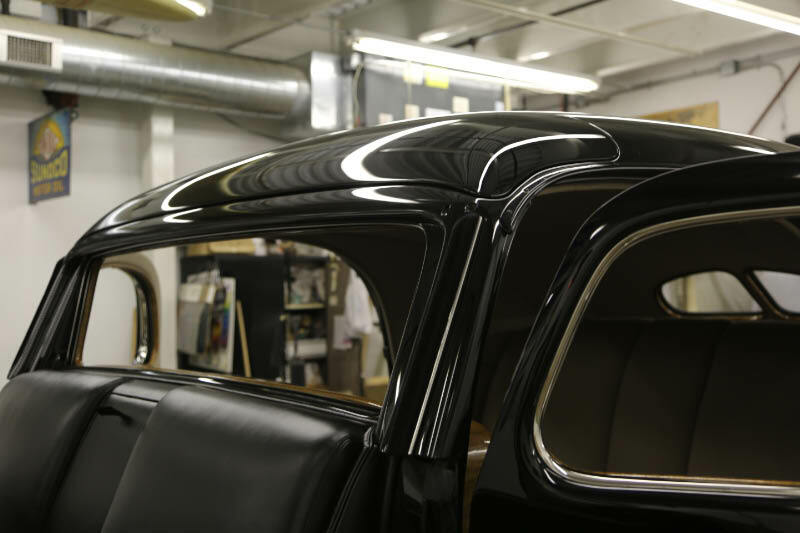 The recreated cover panel that caps the body at the B pillar (the original panel was lost years ago) has been installed as have the rain gutters above the rear doors. 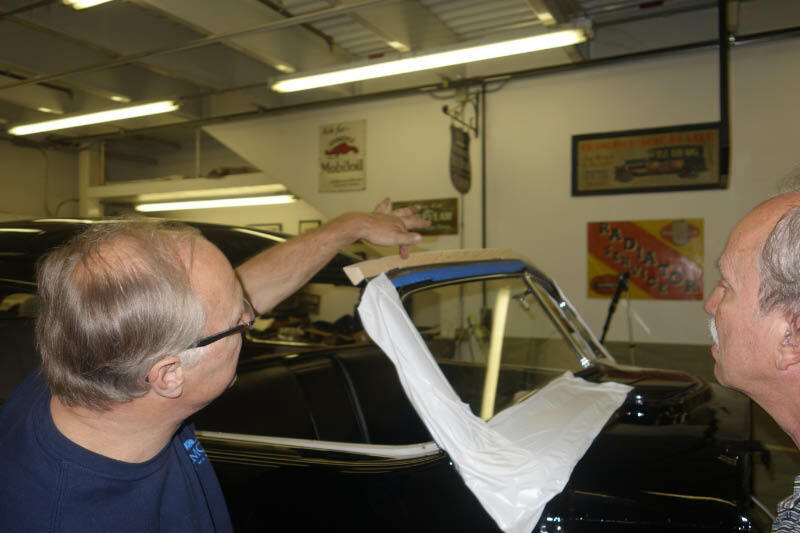 Steve Babinsky shows Walt the header piece they have created to fit the top of the windshield. This is part of the unit that will allow a black waterproof fabric cover to be snapped in place for inclement weather when the solid metal panel cover is not in use. 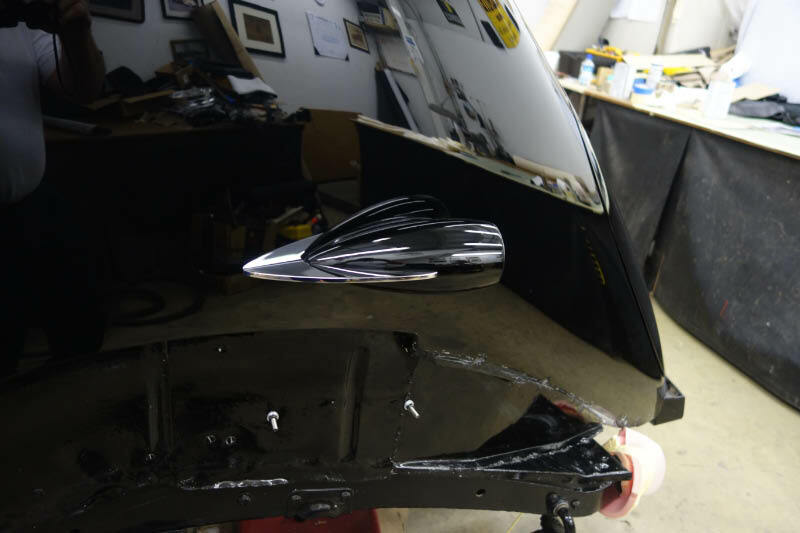 The finished front windshield area is covered to protect the paint while working on the header. 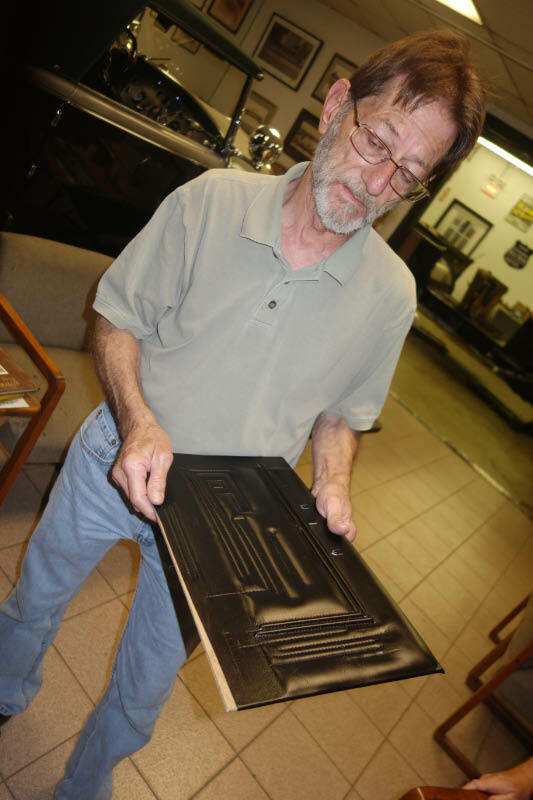 Master upholsterer Jim, holds a sample panel of stitched leather created to determine the various patterns and widths needed for the front interior door panels before the actual sewing of the large door panels began. 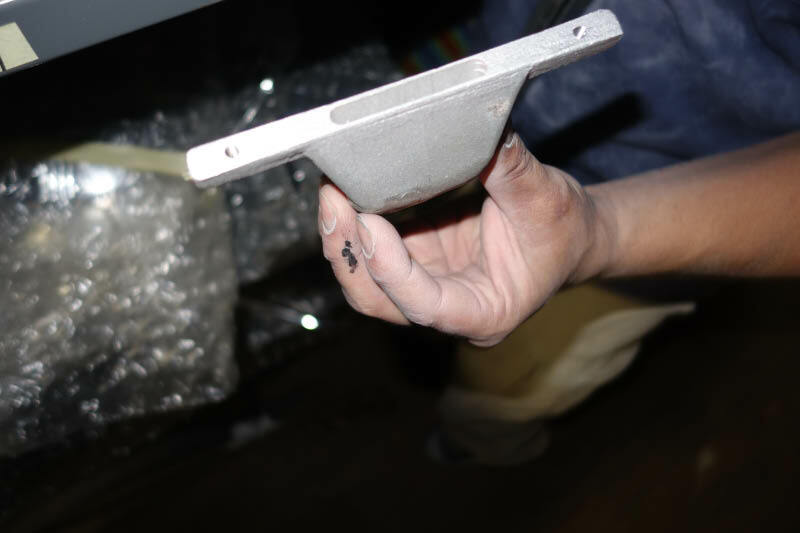 The casting for the defroster vent fits under the dashboard (this is a casting not a less expensive stamped metal unit) and will not be seen. 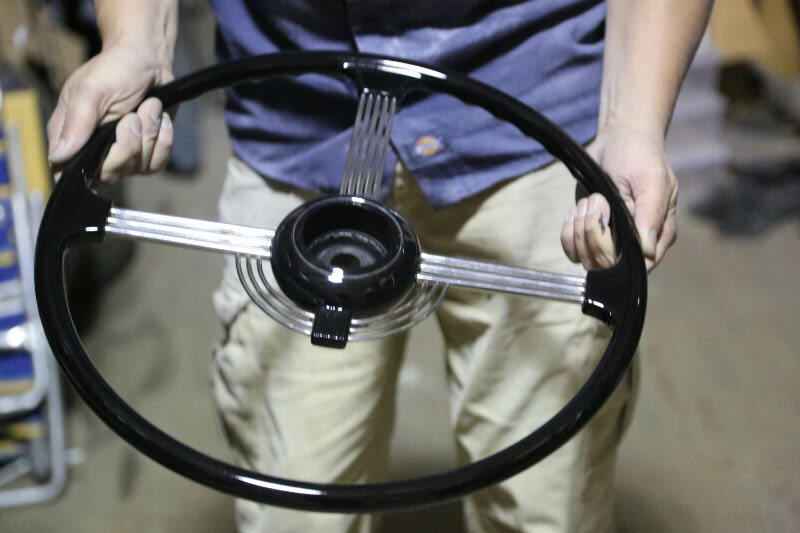 The black painted cover/cap that will be seen that fits to the top of the dashboard is also shown here. Dozens of fasteners , screws, etc still await to be refitted! 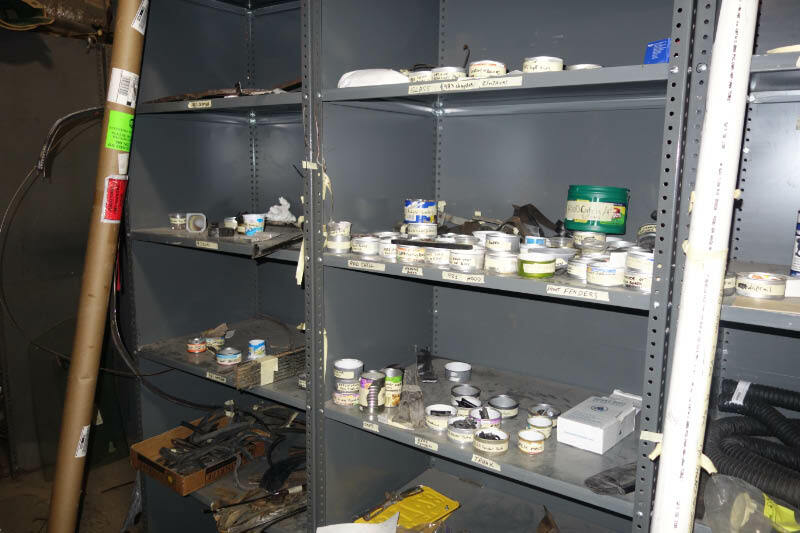 All parts were labeled after removal and inventoried to keep track of them all , now that re-installation is being done 1 1/2 years later. 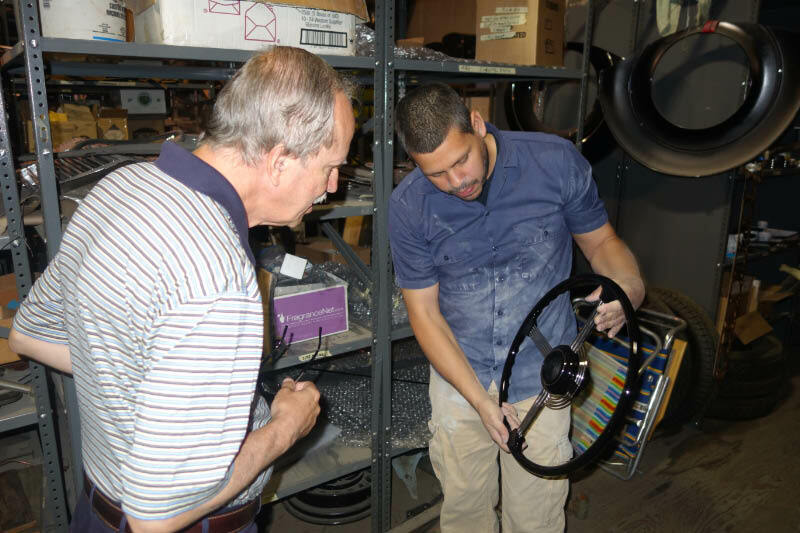 Mike shows Walt the finished steering wheel that we viewed being worked on in the last report. 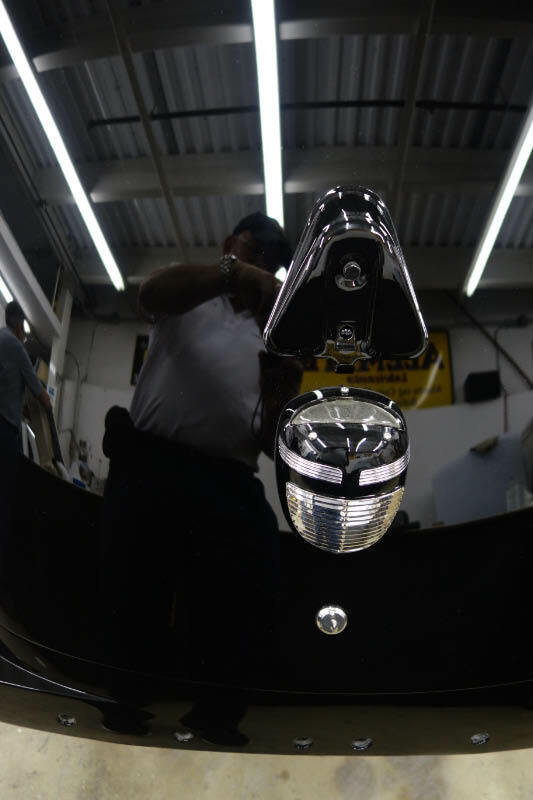 The nickel plated trim has been refitted to the dashboard and gauges are being reinstalled. Everything is of jewel like quality. The tail light shells and plated decorative speed streaks have been installed. 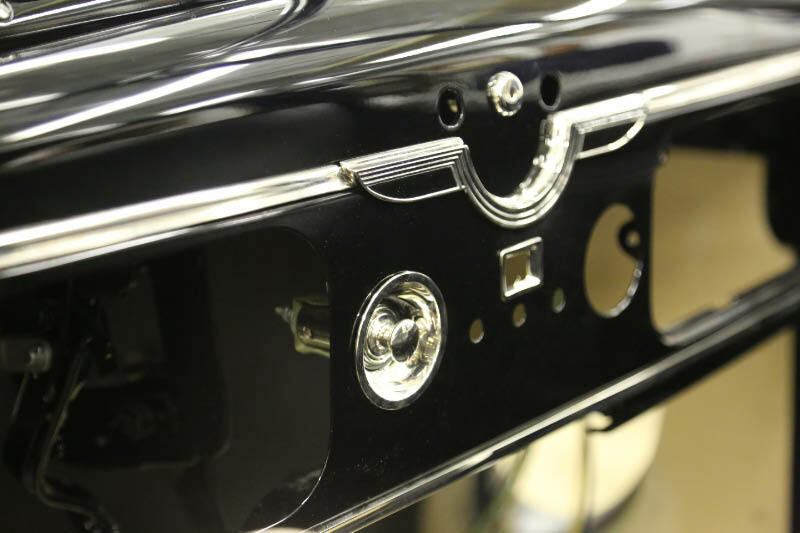 The exterior trunk light is a miniature of the styling of the radiator shell . 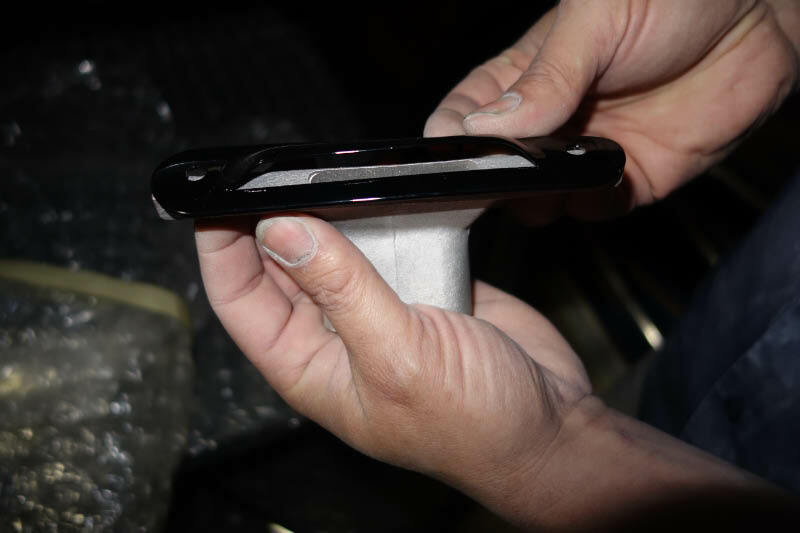 The license plate mounts to the bracket above it and is lit from the light below. Jim shows how the center trunk panel folds up for access to the spare tire which will lay flat on the floor . The carpet on the shelf can lift up to reveal a hole that allows air to be added to the spare tire without lifting the shelf. The open trunk shows the fully carpeted trunk area , even the inside of the lid is carpeted as it was originally. That trunk lid is very large and heavy. 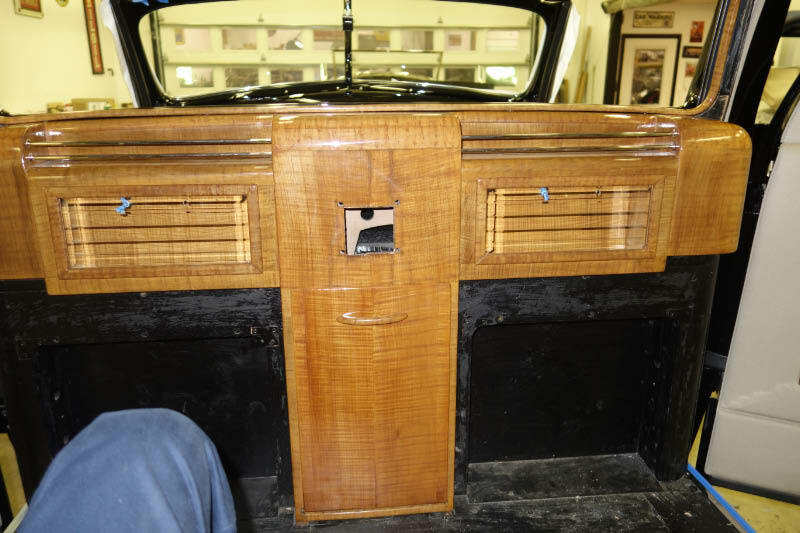 At the center top near the body edge is a button to turn on/off the trunk light located in the center of the lid. 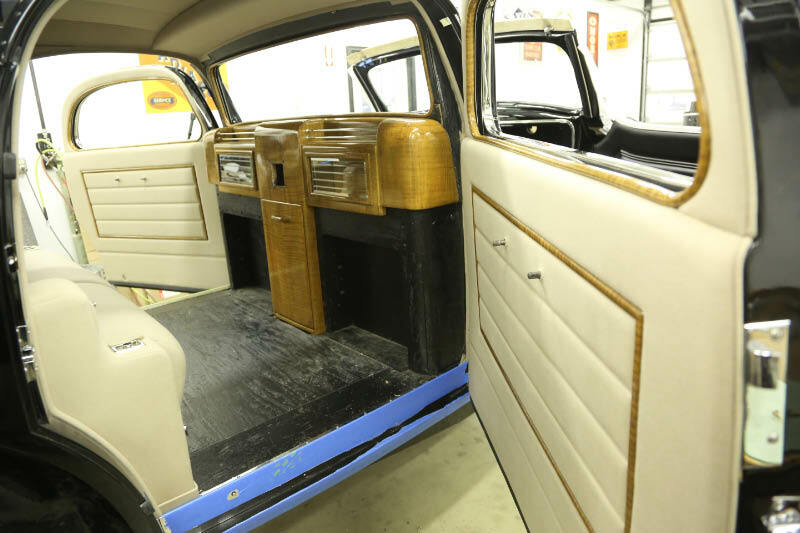 With both rear doors open the beauty of the horizontal panels in the upholstery can be seen. The interior is as amazing to view as is the outside of the car. 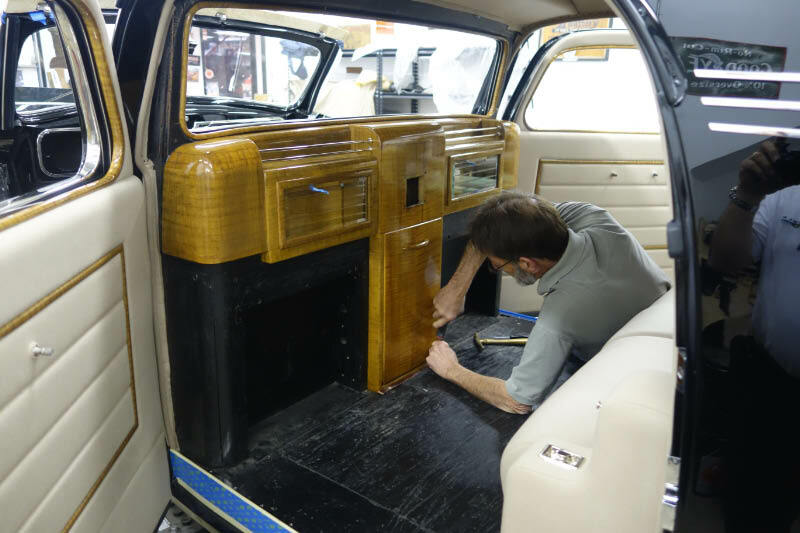 Master upholsterer Bruce shows the ash tray location in the center of the rear arm rest. Jim working on the base of the division panel. 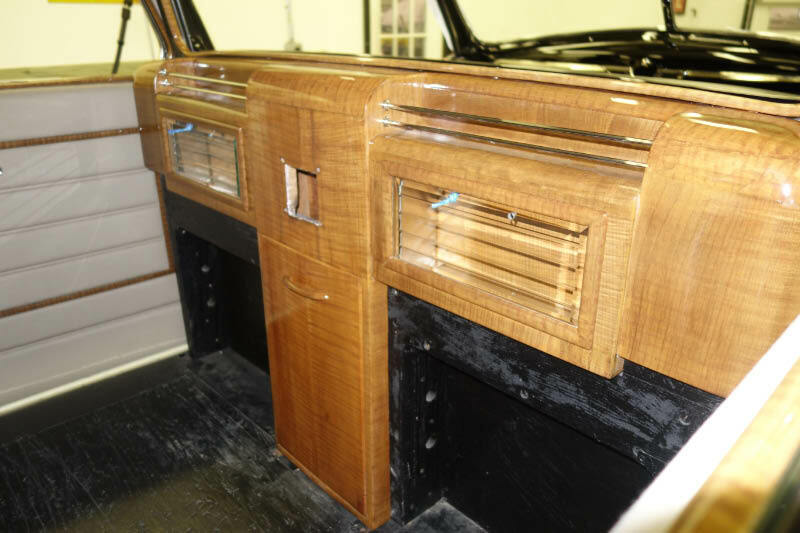 The rear vanity/division partition woodwork has been restored and reinstalled. The wood is quarter sawn flame tiger maple. 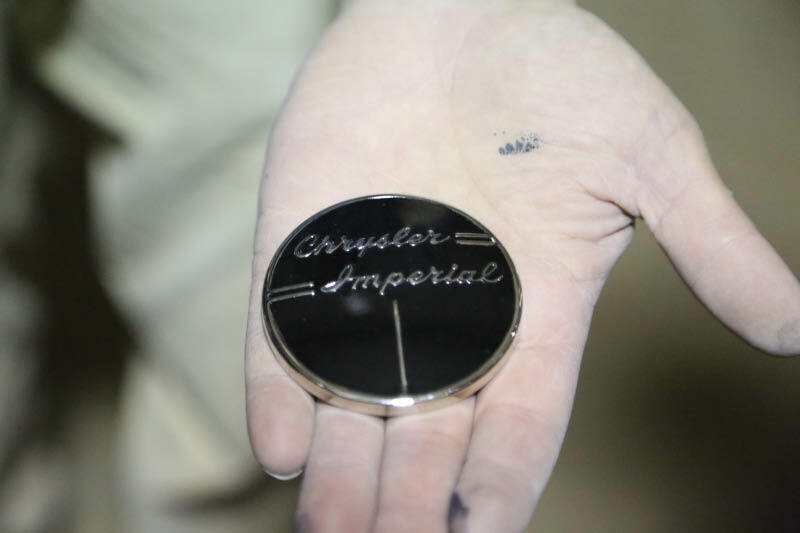 The clock will be mounted at the center. 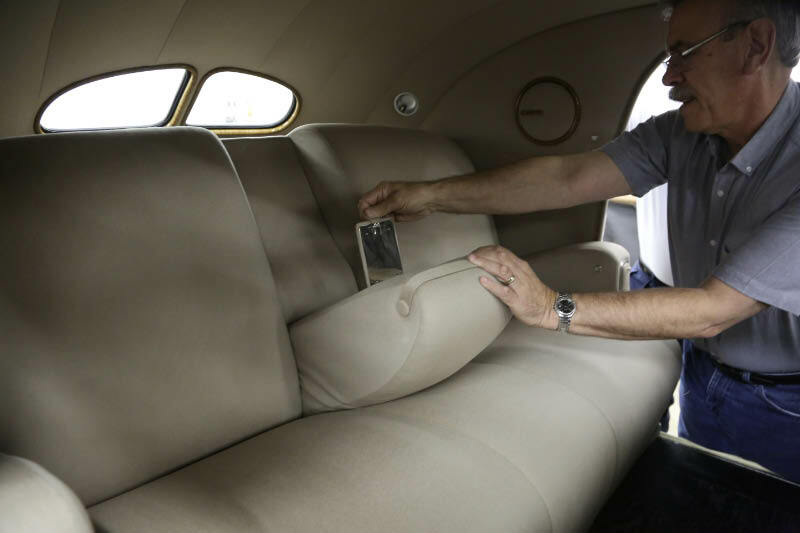 The auxiliary seats have been reupholstered but are not yet installed. 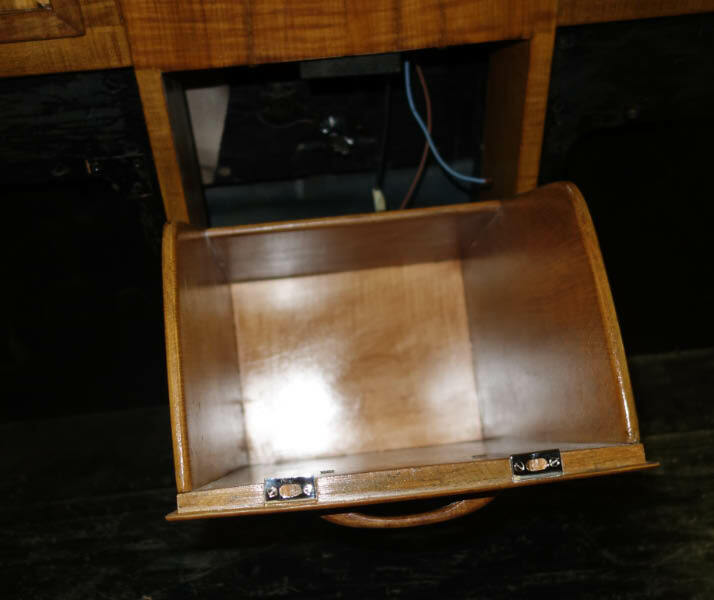 The inside of the center vanity has a shelf that tilts out at the top and will be lined in metal. It was used to hold bottles of liquor. 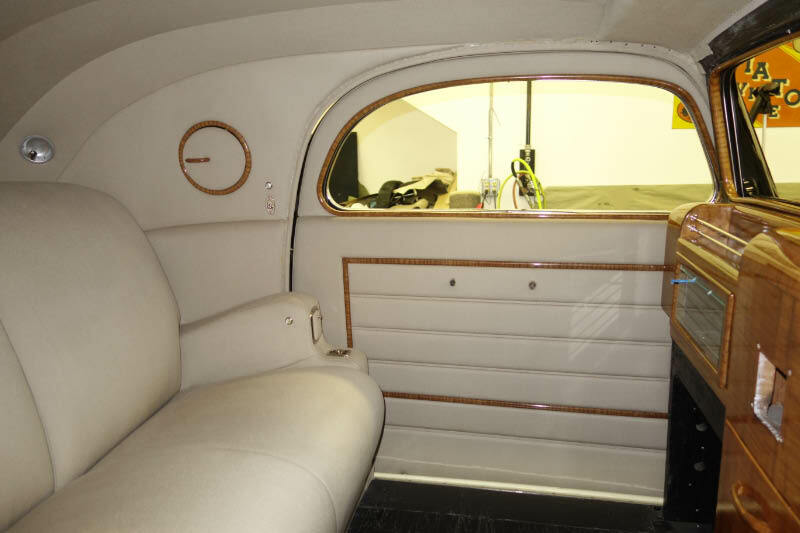 The large width of the rear doors could not be sewn in the sewing machine normally used that has a 20 inch arm depth. A sewing machine with a 25 inch arm depth had to be brought into the shop (this is a large cast iron piece of equipment) to do the job. To keep a perfectly straight line while being sewn takes a very steady hand and decades of experience. 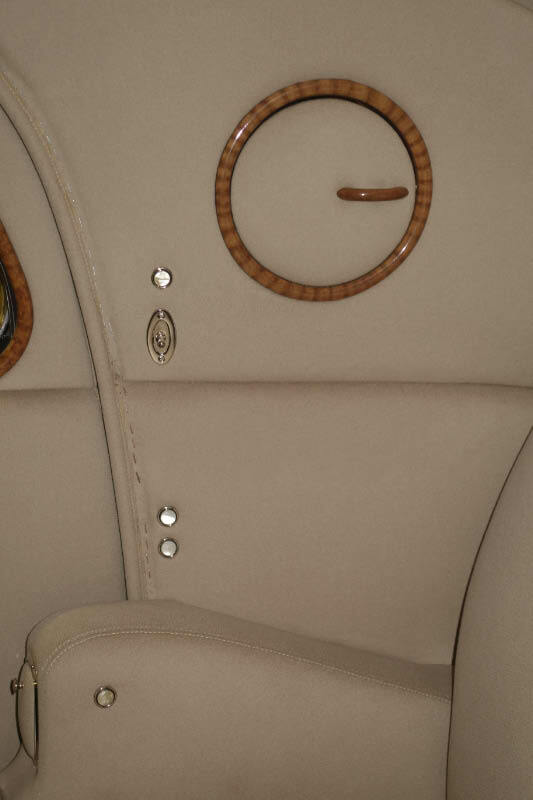 The right rear quarter panel shows the assorted buttons connected electrically to the components to serve the amenities of the rear compartment - call button to the chauffeur, vanity light, reading lights, and one separate button to illuminate the clock to be able to have it seen clearly in the dark at night. No wonder there is 1,500 feet of wire under the upholstery in the rear compartment. Over all view of the cars currently in the shop . The bright blue convertible is a Lincoln Continental that was owned when new by famous pre-WWII band leader Paul Whiteman. He was the man who commissioned and paid composer George Gershwin to write "Rhapsody in Blue" as sen in this rather odd 1930 film. Very Cool & will be a big hit at Pebble Beach. Hats off to all involved in the restoration. Wow. 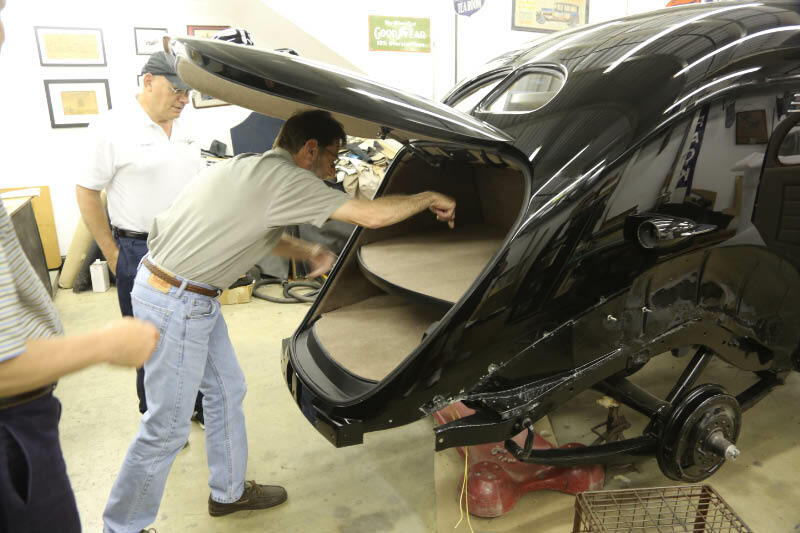 Outstanding restoration on a piece of history. One of the most outstanding automobiles I’ve ever seen coming back to life. Beautiful, why cant the auto makers recreate this beauty for today’s buyers? What a job this is turning out to be. The work that has been done is remarkable, the best I should say, you can’t get any better than that, perfection, WOW!!! pictures don’t do justice, have to see it live. Bravo! 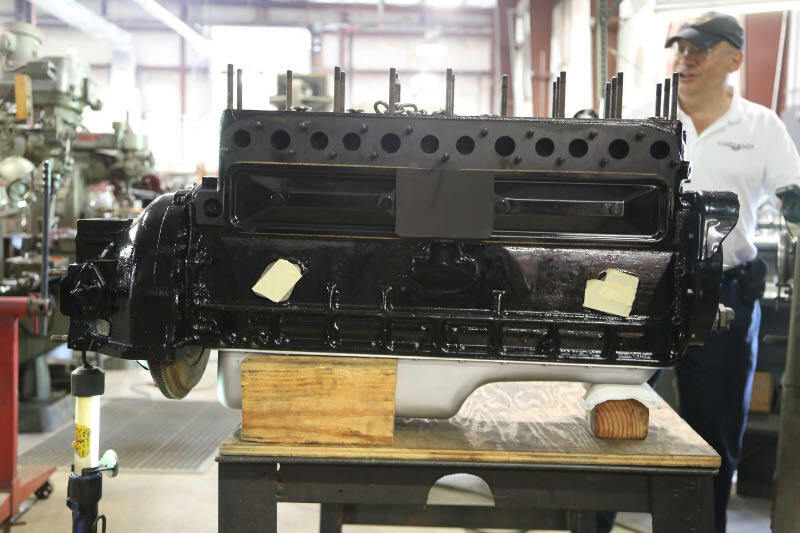 It has truly been a pleasure to watch this restoration as it progresses. I can’t wait to see the real thing! Your commitment to preserving our heritage is inspiring. Kudos! Sam, there are no openings in the back of the car. The discs just held mirrors. The Chrysler is absolutely stunning, Howard! Wow it takes you breath away. I hope to see it in person some day. Great Pics and write up Walt! Howard, This car is looking fabulous! It has become one of my favorite cars. I just love the design. What a piece of art!!! This car is breathtaking - I cannot wait to see it when it returns from California. What a nice rolling tribute to the craftsmen of yesterday and today ! Perhaps you will pick a Big Band Theme song for it…maby Benny Goodman….. It keeps getting more and more exciting - I can’t wait to see her in action - likely first on a new video, eventually in person!